We tried out Blaze Pizza at the Carlsbad Outlets a week ago, and Tyler had arugula on his pizza. I tried a bite and found myself at Trader Joe’s the next day picking up a bag. :) I’ve always avoided it because it gets deemed as a “spicy” and “peppery” lettuce, but it turns out I really like it! We’ve been making pizza about once a week around here, and this is my new go-to recipe. Next time I’d even add toasted walnuts – they’d be incredible! NOTE: I have found the best way to use Trader Joe’s pizza dough is to give it a good, long rest on the counter before you use it. It says to take it out of the fridge 20 minutes before baking, but I like to give it a rest out of the fridge for 40 minutes to an hour. I oil a small bowl, plop the dough in, and spread some oil on top to keep it moist. Then I just let it sit for a bit while I’m prepping my pizza ingredients. Preheat your oven to 500-degrees. If you have a pizza stone, make sure your stone is in the oven preheating as well. Set your pizza dough aside. While it’s resting, slice your onion very thinly and toss it in a skillet with a tiny bit of oil. Cook it for at least 20 minutes on medium-low heat until it is nice and caramelized. When your onions are almost ready, thinly roll out your pizza dough*. Brush your dough with olive oil, and evenly distribute the caramelized onions on top. Then crumble on some goat cheese, and layer with the potatoes. Salt and pepper it, and cook it in the oven until it’s got a nice, golden crust. 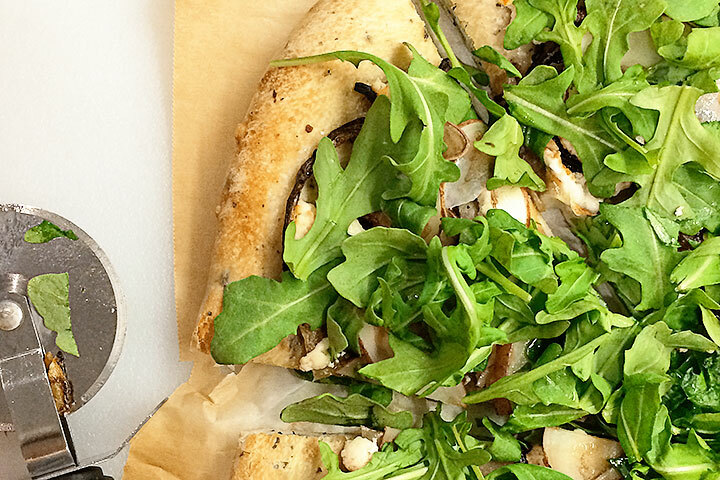 After pulling the pizza out of the oven, top with arugula, and drizzle with balsamic vinegar. Slice and enjoy! *There are tons of methods for doing this, but we have found the easiest for us is to roll it out on parchment paper on top of a thin flexible cutting board. Then when it’s time we just slide the pizza and the parchment onto our stone in the oven.